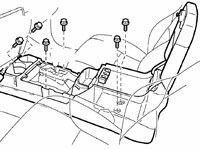 Choosing a rear seat entertainment system for my 2007 4Runner Sport Edition. Factory or aftermarket, that is the question. Toyota offers a factory RSE package, Option code EY, $1,264 invoice / $1,580 msrp, which is an overhead monitor and rear-seat DVD entertainment system with rear audio remote control, RCA jacks and two wireless headphones. Since I did special order this vehicle, this is something i had a choice of getting but decided against. 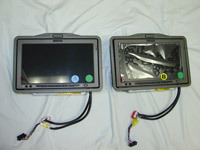 The reason for not opting for this is two fold...a) the EY option requires the Power Glass Moonroof, option code SR, $720 invoice / $900 msrp, which I was dead set against getting this time around and a major factor for doing a special order in general and b) I did not want an overhead type LCD monitor based rear seat entertainment system. It blocks your view out the back and your kids need to not only share the system but need to look up and towards the center of the vehicle, can you say neck stress? This would simply not work for my purposes. 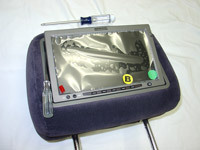 The alternative, LCD monitors built into the headrest itself, looked like a perfect solution. These don't cost much more than the factory RSE either. Depending upon the brand and features you choose, they start at the same price as the factory overhead system and go up to about 25% higher in cost. Well worth it in my mind. 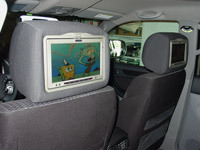 You can get this type of system with built in DVD players in each headrest and therefore each rear seat occupant can watch their own video. They play Cd's and MP3's like the factory system and you can hook up a game system as well. So the choice was made to go with a headrest based system. You can buy the components separately or in a kit which comes pre-packaged with everything needed. Having the components separate was not for me for a couple reasons. 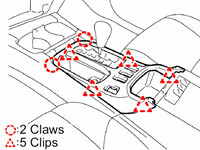 You need to mount the DVD player in either the center console or glove box. Since I wanted each monitor to have it's own DVD player this would require some significant space useage. Although this could be an overall cheaper option, it would be a hassel to buy separate components that ultimately all work together. 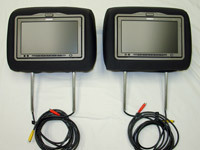 Then you need to cut and mount these monitors into your factory headrests. Actually this part I liked. You see the front seat headrests on the 4th gen 4Runner are very comfortable in my opinion. I like the way they pivot whereas the bottom of the headrest is what moves front to back. 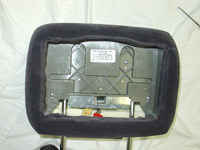 Getting pre-built headrests does not mean they would be exactly shaped like the factory ones, as the electronics inside will dictate the overall shape. But cutting monitors into you stock ones guarantees it. But another reason to opt against cutting in separate monitors is that it would be near impossible to fit even 7" sized monitors into the factory headrests. Unfortunately the headrests are just not quite wide enough. The pre-packaged kits on the other hand, come with everything needed. 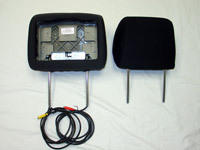 Factory matched replacement headrests with both the LCD monitors and either one or two DVD players pre-built in. 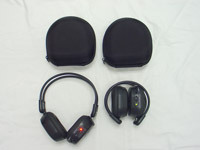 Infrared (IR) wireless Headphones, Remote Control, audio/video controller with auxiliary RCA style inputs and outputs, etc., all included. I narrowed down my search quickly to two competing brands. Audiovox and Vizualogic. Both have a similar feature set, but the Vizualogics have a slimmer bezel and are available in both 9" and 7" versions whereas the Audiovox is available only in 7" size. 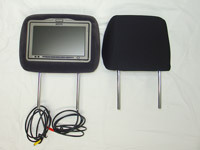 I decided on getting the Vizualogic A-1290 9" LCD monitor DVD headrests. The 9" widescreen size, at the time of this writing, is top of the line equipment. The 7" screen size is a little too small, especially when you consider that when playing a standard 4:3 aspect ratio DVD pillarboxed, which would have black bars at the sides of the screen, will look even smaller. Built in DVD Players - Top slot loading DVD players makes inserting and changing DVDs easier for children and other backseat passengers, does not take up valuable console or glove box space. 7 or 9 inch TFT-LCD Monitor - Wide aspect monitor (16:9 ratio). On screen DVD Controls - For easier viewing. Wireless 2 Channel Headphones - Included. 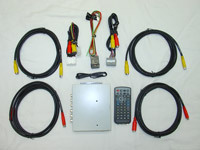 Wireless Remote Control - for on screen display functions and DVD control. 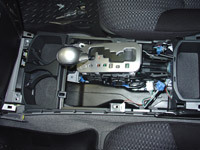 Wireless Audio - Built in Wireless FM modulator allows audio playback through the vehicle's stereo speakers. Headphone Jack - For wired headphones (not included). Auto Detect Auxiliary Video Inputs - headrest 3.5mm front panel and a/v RCA style controller inputs. iPod Connectivity - With front-mounted auxiliary input jack. 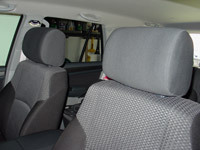 My research has uncovered the fact that no manufacturer at all (as of mid 2008) makes a pre-packaged factory matched kit for the 2007 4Runner Sport Edition with the dark charcoal fabric interior. Just my luck. 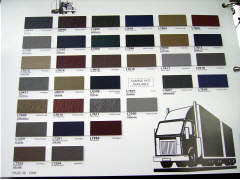 It is possible to get the stone and taupe fabric for the 2003-2008 SR5 models and the stone and taupe leather for the 2003-2008 Limited model 4Runners. 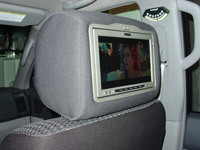 Vizualogic, who advertises their product as being available for thousands of different vehicle model combinations, does make a headrest matched to the dark charcoal fabric/cloth interior of the 2003-2005 4Runner Sport Edition. 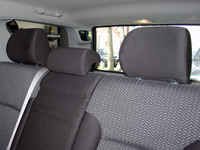 Well Toyota changed the fabric for the 2006-2008 4Runner Sport Edition to a much darker color overall and the headrest is actually soild black. 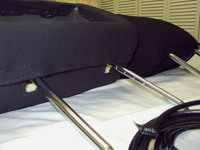 The 2003-2005 4Runner Sport Edition headrest fabric has a velour texture whereas the 2006-2008 headrest fabric is much smoother and finer material. 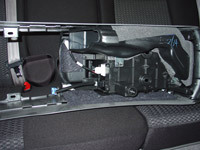 I contacted Vizualogic a few times and they had no idea if they would ever produce a specific factory matched fabric version for the 2006-2008 Sport Edition interior. I explained to them how they made a specific fabric for the Sport model for the 3 year run between 2003-2005, and how the 4Runner was already in a 3 year run with the new fabric to no avail. So a custom solution was the only way to go. 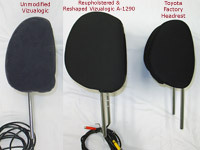 I decided to purchase the 2005 dark charcoal headrests from Vizualogic, model # 912-99031-8130, with the thought that possibly I could try to dye the fabric black. As luck would have it, turns out the 9" size were on backorder for a month already and would be so for a few weeks more. I ordered regardless and finally they arrived and while the color was off as expected, it was clear the velour type fabric texture just wouldn't work even if dyed black. I should mention at this point that as noted earlier, though marketed as a "perfect match" for each specific model vehicle, that mainly applies to the color and fabric. 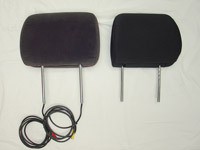 There is no guarantee that the shape of the headrest will be exactly like the factory versions. Turns out these are much plainer than the stock headrests. 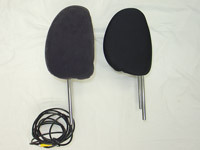 They are not generic headrests like other brands, but they are not exactly like the OEM versions. 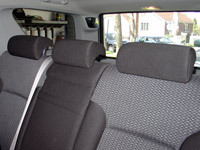 The Toyota headrests are sculpted in the front for where your head hits, it is a nice touch and is pretty comfortable. The Vizualogics are simply flat across the front. 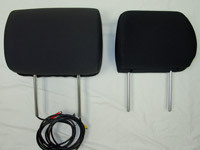 Additionally if you hold the factory and Vizualogic headrests with the posts in the same location you will notice that the foam on the front of the factory ones protrudes out a few more inches closer to the driver/passenger than the aftermarket versions. Again, The Toyota ones are much nicer in this respect. To avoid having any problems with the customization I decided to remove the lcd monitors from the headrests before going to the automotive upholstery shop. This way there is no chance of damage to the monitors nor scratches on the bezel, etc. The process of removing the dvd player / monitorcombo is not described in any of the literature of manuals, but here is how it is done. 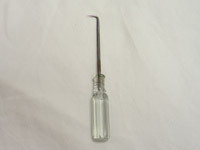 Using some sort of hook/pick tool, such as the Craftsman 941513 shown below, insert it between the bezel and the monitor one inch below the upper left and right hand corners. If you look in there you will see a bar with a hole in it. That bar stops the monitor from opening past a certain point when inserting a DVD. Using the pick tool, you can swivel this bar downward and out of the way so that the monitor will fully open. This reveals four philips head screws which you need to remove next. 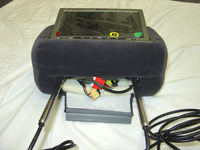 This allows the entire monitor and bezel unit to pull out from the headrest. But the wiring needs to stay in the headrest as is is routed in such a way including through the headrest posts that it cannot be removed. So before pulling the bezel/monitor assembly out, undo the fabric flap between the posts which is held together by a long plastic clip. This exposes the wire harness clips. Unconnect the harness clips, there are two for each monitor. Then pull out the monitor and bezel assembly. I found a local Automotive upholstery shop and paid them a visit. 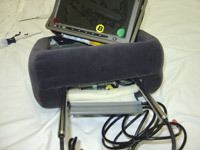 The main reason was to recover the headrests to something that would match the factory fabric as closely as possible. The side benefits of going the custom route was that now I could get foam added to the front and reshaped to a more factory look and feel. 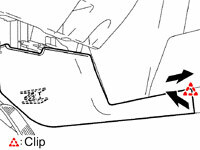 Also I could have them make custom slip on security covers that could be used on the headrests when not in use to hide them. 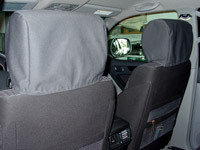 We quickly found that an exact factory match to the 2007 4Runner Sport Edition with the dark charcoal fabric interior with black headrests was not produced at all. I guess that may be a reason Vizualogic doesn't make them, as ther is no aftermarket source for the fabric. I was given three books to look through, each with over 50 pages and each page containing dozens of fabrics. First thing I noticed, and was told, was that a true black with matching texture and sheen was going to be near impossible to find. I expected this in advance of purchasing the headrests and felt that I would be able to live with this if it turned out to be the case. The front seating side of the 4R seats are comprised of a multitude of shading down the center section from dark gray to charcoal to black. While the back of the seat is indeed solid black as is the headrest, the back of the headrest was virtually all LCD screen and the front would blend right into the variegated center panels of the seat. There were plenty of dark charcoals, ebonys, and near blacks to choose from but none that really looked 100% exactly like what I needed. I picked the closest and special ordered that fabric. The fabric took a week to come in and then it took the shop a week to find time to fit this small project in. In the mean time I began the install of the wiring and a/v controller. 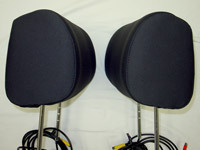 Here are pics of the customized headrests when they came back from the automotive upholstery shop. This is very basic wiring and really is simple to do. 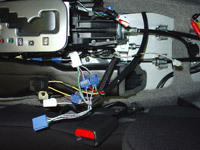 It does take some time to make the wiring nice and neat but all you need to do is to mount the a/v controller, connect four wires to the vehicle and run the video cables to the monitors. There is no mounting place for the audio/video controller in or under the console so I decided to mount it under the passenger seat on top of rear vent. I used double sided velcro tape (not included) to do so. Fish a coat hanger from the console area, under the carpeting, to the factory carpet cutout under passenger seat next to the vent. 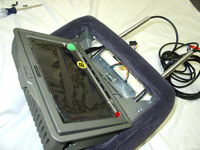 I installed a protective wire loom (also not included) on the Vizualogic 4-wire system power harness, before threading it from seat area under the carpeting to the console, by taping it to the coat hanger. Then we make the wire splice connections. Although the cigarette lighter (ashtray and lighter kit accessory) is an option on the 4Runner, the wiring is there regardless of weather or not you have this accessory. It is the wire harness made up of the white with black stripe wire (ground) and the pink with blue stripe wire (12v acc power). I used this to make three out of the four wire connections needed to hook up the Vizualogic's. I made all wire connections using blue T-Taps (not included). I connected both the Black and the Green Vizualogic wires to the cigarette lighter ground wire. You don't need to connect the green wire, and the manual doesn't really say what it is used for, but I connected it anyway. 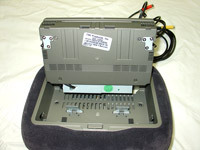 I have a feeling it is used when connecting the a/v controllers RCA outputs to an additional monitor such as a front seat visor mounted lcd panel. 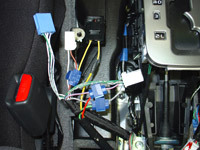 The Red Vizualogic wire is the main 12V power wire and you want this to have power when the vehicle is either on or the key is in the accessory position. This way when you shut the vehicle off there is no chance of leaving the monitors on. I attached this red wire to the cigarette lighters pink with blue stripe wire. 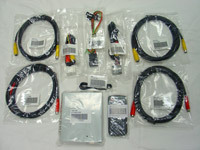 The Yellow Vizualogic wire is the constant 12v power wire. This wire provides the power for the memory when the vehicle is off. You can leave the monitors on when shutting down the vehicle, they will turn off, then when restarting it will resume right where you left off. I connected this wire to my modified fulltime 12v power point. Please note that you would need to perform the mod first if choosing this as your power source and this wire is usually hot only when the vehicle is on. If you have not and ae not interested in performing the mod then run this wire to the battery or somewhere where you can get constant 12v power. 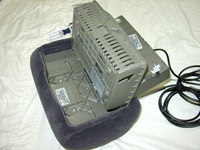 Next I ran the monitor cables from the a/v controller to the headrests. Unzip both seat backs. 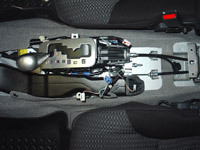 Then starting with the passenger side, simply route the wires under the passenger seat, and into the seat back from the bottom. While doing this I also ran the FM modulator antenna up the passenger side seat back as well. 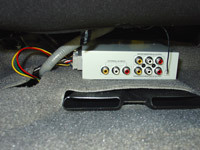 For the driver side wires, snake them from the a/v controller under the carpeting and into the center console area. That is all they will reach. 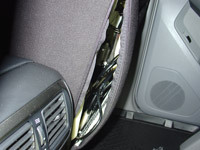 Use the provided extension wires and snake them under the carpeting to the factory cutout in the carpeting under the driver side seat. 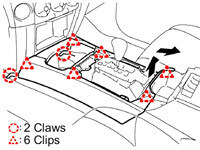 Then route the wires under the driver seat, and into the seat back from the bottom. 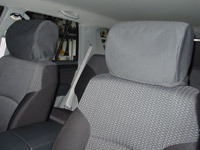 When installing the headrests make sure the driver side is screen A and the passenger side is screen B. Pop in your headrests, connect the cables, and test your work. 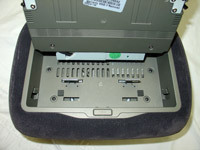 Zip up the seat backs, reinstall the console and you are done! 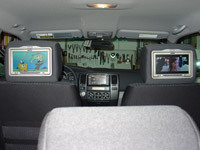 This system plays not only DVD-Video but also CD's including CD-R and CD-RW and Mp3 audio discs. 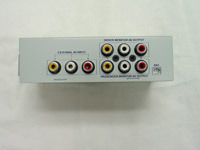 You can connect a video game system, VCR, digital camera, camcorder, IPOD, or other devices using the 3.5mm front panel jack or the a/v controllermounted RCA jacks. You can additionally send video out via the RCA jacks on the a/v controller to other monitors such as a front seat visor mounted lcd panel. You may be wondering, as I was before ordering these units, will these DVD players play DVD's made on your personal computer. The answer is Yes they will. I burn movies from my computer to DVD+R media and always manually set the book type to DVD-ROM. All my discs processed this way have worked on the Vizualogic's so far. As an FYI, I use Nero 8 Ultra Edition with DVD+R 16x speed discs but lower the burning speed to 8x. I don't use DVD-R media, nor do I burn to DVD+R's to their native DVD+R book type, so I cannot say how that works.